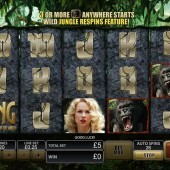 Released around the same time as the Cryptologic King Kong slot, Playtech's offering is firmly based on Peter Jackson's Hollywood remake of the classic 1920s action film. And for fans of Playtech slots and Hollywood blockbusters alike, there's plenty to enjoy. 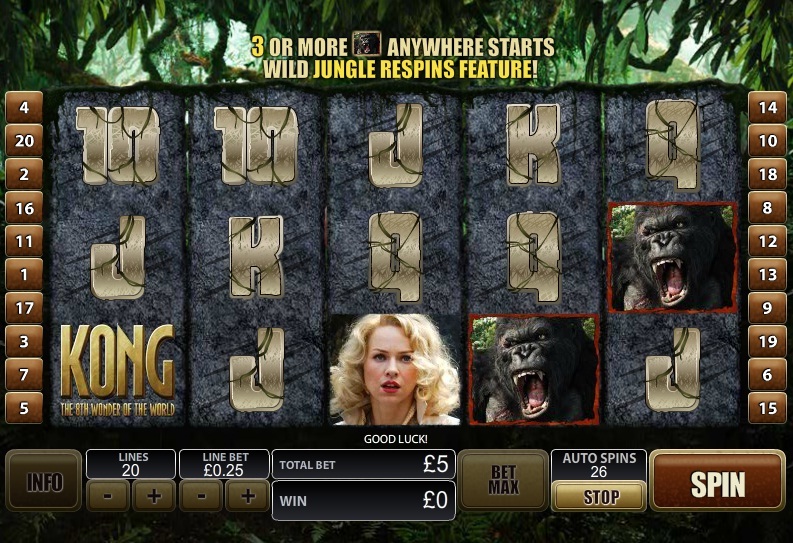 This movie-inspired video Kong slot has clips and sounds from the 2005 motion picture and includes star characters on the reels, including Kong himself. The King Kong symbol acts as a scatter, so if you get three or more you will trigger the bonus round, but more about that in a bit. The game is split into two modes: Jungle mode and Big City mode. You move between them when you trigger the second bonus round by hitting 3 or more Kong scatters anywhere. This also initiates a separate bonus round which is different in either mode. You will be swatting down planes in the Big City or picking dinosaur bones in the Jungle. You can win up to 50x your stake in this bonus round. The free spins bonus in either mode is triggered by getting three or more Kong symbols (the ones with the Gorilla on). During the free spins you will get either sticky Wilds or wild reels that can really boost your wins. Personally I play this game for entertainment rather than big wins, as it can be a long wait in between bonus games. However, the recreation of the Hollywood film, including lovely Naomi Watts, is effective at least. Personally, I generally prefer slots like The Hulk or the exciting Fantastic Four game, that are just as exciting and graphically rich, but tend to be more rewarding.